In this post we comprehensively discuss the pinout function, electrical specications, and application designs for the power transistor 2N3055. If you are an electronic hobbyist, you might have certainly used this very useful, and efficient power transistor at least once in your experiments. I have used 2N3055 transistor many number of times in many of my high current circuit applications without any issues. Just like any other npn BJT, 2N3055 connections are also pretty straightforward. In the common emitter mode which is most frequently used configuration, the emitter pin is connected with the ground line or the negative supply line. The base is connected across the input signal through which the transistor needs to be switched ON or OFF. This input switching signal can be anywhere between 1V and 12V ideally. A calculated resistor must be included in series with the base pinout of the transistor. The base resistor value will depend on the load specifications attached at the collector pin of the transistor. The basic formula can be studied from this article. The collector pin should be connected with one terminal of the load, while the other terminal connects with the positive supply line. The load current specs must be at any cost lower than 15 amps, in fact lower than 14 amps to avoid current reaching the breakdown limit. Maximum ratings are the highest tolerable values beyond which a permanent damage can occur to the device. These ratings specified to the device are stress limit values (not the standard operating criteria) for the particular device and are not valid simultaneously. If these limits are exceeded, device may cease to function with its standard specifications, causing severe damage to the device and also affecting its reliability parameters. The transistor comes with a couple of limitations in terms power handling capability. Safe operating area curves indicate the IC − VCE limits of the 2N3055 transistor that must be taken care of in order to ensure a stable and error free operation. Meaning the transistor must not be operated to increased dissipation levels than what is advised in the curves traces. The data given in the figure below is plotted while TC = 25°C; TJ(pk) is variable in accordance with the power level. The 2N3055 is a versatile NPN power transistor which can be effectively applied for all medium power (current) delivering circuit. The few main of these applications are in the field of inverters and power amplifiers. Due to relatively high hFE range this device can be used in a wide range of circuits for handling high current efficiently. It's metal TO3 case becomes ideally suited for attaching a fast cooling large heatsink quickly and easily allowing the device to work in its most favorable conditions. I have plenty of 2N3055 based circuits in this website, glad to present a few of them here. The circuit is the most basic form of power amplifier which can be build using a single 2N3055 BJT. Although the amplifier above looks too simple to make, the low-tech design forces the 2N3055 to dissipate a lot power through heat. 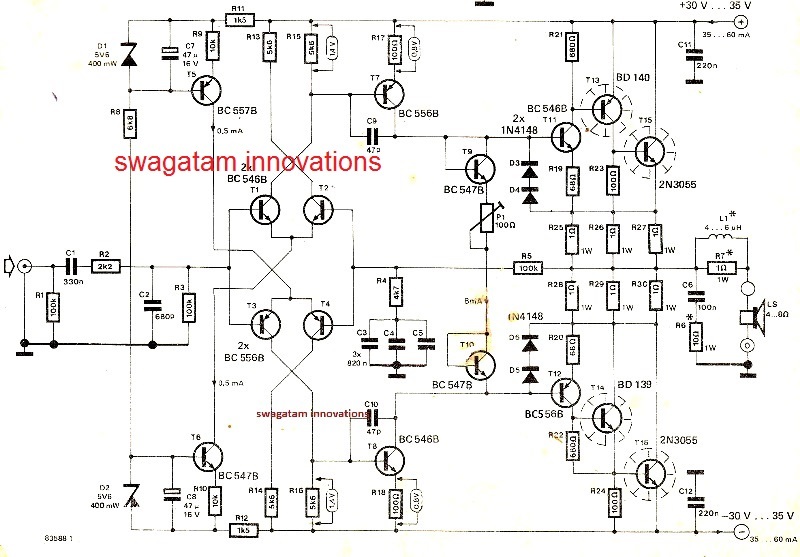 I am sure you might have already come across this little inverter circuit. This circuit using only two 2N3055 and a transformer for creating a reasonably powered 60 to 100 watt 50 Hz power inverter. An ideal project for all new hobbyists and school students. This simple automatic 2N3055 based battery charger circuit can be used for charging any lead acid battery from 12V to 48V. The high current handling capacity upto 7 amps of this device will allow an ideal, charging for any battery from 7 Ah to 150 Ah using the above circuit. It has an automatic cut-off feature which will never allow the battery to get over charged. From the above posting we learned the main specifications and datasheet of the versatile workhorse transistor 2N3055. This transistor is a universal power BJT that can be used in almost all higher power based applications where high current and efficient switching of current is expected. The maximum voltage this device can handle is 70V which looks very impressive, and a continuous current for around 15 amp, when the device is mounted over a well ventilated heatsink. We also studied a few cool application circuits using 2N3055, and how to connect it through its pinout diagram. If you have any further doubts please use the comment box below for interacting.